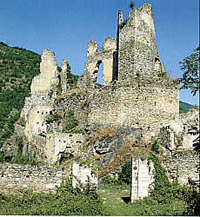 The present ruins are impressive, as is their location, untouched so-far by the Cathar tourist industry. Take the D25 from Axat towards Ax-les-Thermes. It is open to the public 10am-1pm and 3-7pm daily in July and August, weekends only in September, October and November. 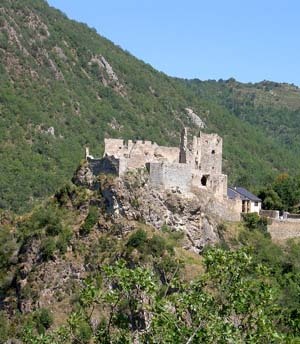 Not far away is the Château of Donezan, where Cathars were still holding out eleven years after the fall of the Château of Montségur. 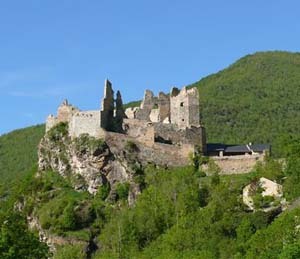 Usson lies in the Ariège south of the département of the Aude on the river of the same name. It is situated at 920 meters in height and dominates the valley of the Aude. Puilaurens is 30 kms way, Puivert 49 kms and Quéribus 60 kms. In 1226 Bernard, the Lord of Usson paid nominal homage to the King of France, but his sympathies still lay with the Cathars. 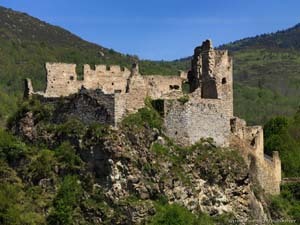 Towards the end of the wars against the Cathars this was one of their last sanctuaries, providing support for the Château of Montségur ( Montsegùr) The seigneurs of Usson, Bernard d'Alion and his brother Arnaud d'Usson sent arms and supplies to their besieged comrades there. On 15th March 1244, the day before 225 Cathar Parfaits were burned alive at Montségur, four other Parfaits left the castle there for Usson, where the Cathar treasure had been evacuated a few months earlier. What this treasure was, and what happened to it, no-one knows. This mystery has fed a number of fantasies about the equally mysterious treasure supposedly found at Rennes-le-Château in the nineteenth century. Bernard d'Alion was burned alive at Perpignan in 1258. 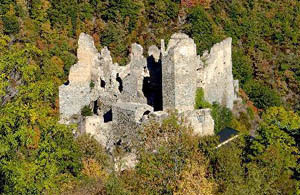 The castle was rebuilt as a French border fortress, and given by Louis XIV to the new Marquis d'Usson. Like other seigniorial residences it was sold as communal property at the French Revolution, after which time it was used as a stone quarry.